Deer hunters across the nation are gearing up for the upcoming deer season. For many hunters, gearing up also includes getting a better idea of the bucks and does that are on their hunting property. A trail camera survey has been shown to be the most accurate method to determine the number of deer, the age class of bucks, and the number of fawns per doe on a specific property. If you are interested in running a trail camera survey on your deer herd, see the detailed instructions of how to conduct a trail camera survey. The first step for a hunter to get more familiar with his deer is to place trail cameras out. We always put ours near attractants or overlooking a food plot. That’s the easy part of conducting a trail camera survey. Pulling the cards and looking at all the deer pictures is fun! For a trail camera deer survey, looking at each picture close enough to uniquely identify each buck can be very labor intensive. We usually end up looking at the same pictures many times to confirm the buck is the same (or different) as in other pictures. Antlers are unique, like fingerprints. A very accurate estimate of the total population and herd demographics can be obtained after identifying each individual buck, the number of times that buck was photographed, and the total number of does and fawns appearing in the pictures. With the hard work completed, there’s still more valuable information that can be gained from these photos! Pay very close attention to which mature bucks tend to be more active during shooting light! Those bucks will usually be much easier to tag than bucks that only show up at camera sites after dark. I also pay close attention to how the bucks, especially mature bucks, respond to each other. I look for mature bucks that are more active during daylight than other bucks AND show signs of being aggressive at the camera site. One sign can be the buck is usually the first to show up among other bucks in the bachelor group. The aggressive bucks are often photographed chasing other bucks away from the camera site. These aggressive bucks tend to respond much better to grunt calls, rattling and decoys. I’ll gladly spend my time hunting for an aggressive buck versus a buck that has larger antlers but shows sign of being totally nocturnal. Such bucks may be practically impossible to hunt and harvest – at least that year. 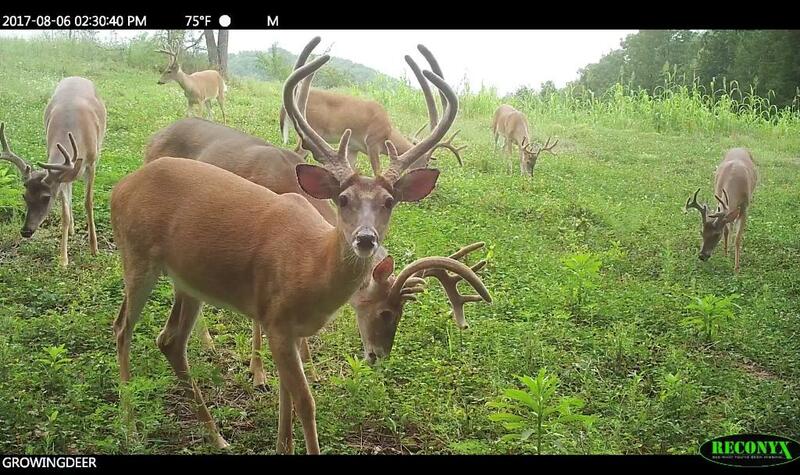 If a trail camera deer survey seems a little intense for you, switching your cameras into scouting mode can be very rewarding, especially if you are hunting in a state that has an early bow season, like Missouri. At this time, the summer bachelor groups have begun busting up and mature bucks are typically changing their patterns from a food-cover, food-cover routine to a bit of overt dominance hierarchy sorting out. This means that some bucks will shift to using other parts of their home range to avoid frequent conflict. Their movement and behavior patterns are changing rapidly during this time of year, which means that M.R.I. (Most Recent Information) is critical, but difficult to obtain. Information a week old can be out of date this time of year. This makes selecting stand/blind sites tough. To stack the odds in my favor I use a combination of M.R.I., past history, and knowledge of food preference when deciding where to place my stands/blinds. For example, a recent Reconyx image (within few days) of a buck on my hit list, combined with knowledge that a mature buck has used that area in the past, and knowing what the current preferred food sources are during the first week of archery season is enough data for me to select and hunt a specific location. Don’t leave your trail cameras in the closet or sitting on the garage shelf! Get out in the woods and put those trail cameras to work!